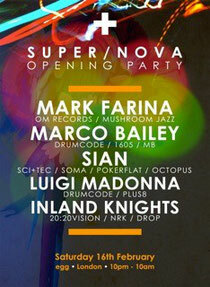 Supernova returns to Egg at Kings X on Saturday 16th February featuring DJ guests from the Moon Harbour and Ovum labels. 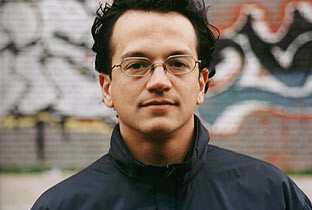 Taking centre stage on the terrace is Chicago/San Francisco house music wizard, Mark Farina, who lands in London for a rare appearance. His West Coast sound is revered by party people and fellow DJs alike thanks to his selection and skills that make him a highly rated DJ. Joining him are Nottingham duo and DJ/producers, the Inland Knights. Veterans of the UK house scene and the Smokescreen soundsystem, the Drop Music owners continue to educate and rock the floor with their special blend of house music. Room one vibrates to the sounds of electronic rhythms served up by a trio of very special guests: Marco Bailey, Luigi Madonna & Sian. MB needs little introduction - a global electronic star who always drops a highly energised and super infectious set whereever he plays. Whether conducting everlasting sweat soaked DJ sessions or creating timeless dance music, Sian is a truly diverse and original talent, at once chic and debonair, always intensely inventive. Neapolitan techno star Luigi Madonna completes the bill, having recorded on Adam Beyers’ Drumcode imprint, Richie Hawtins Plus8 label plus a slew of material on fellow Neapolitan labels.